After writing a WWII novel about a real-life female football coach, a Dallas sportswriter decided to become one herself. Marjorie Herrera Lewis discovered the story of her sportswriting career in her allergist’s office. The former Star-Telegram and Dallas Morning News writer had covered the Dallas Cowboys beat, breaking stories on contracts and trades during the Tom Landry years. But it wasn’t until she showed up for a pinprick test at her doctor’s office in Bedford that she found the inspiration for When the Men Were Gone, the novel she had always wanted to write and finally published in October. Lewis’ nurse of more than two decades, Jean VanWaters, was trying to make small talk to distract her patient from the needle sticks when she noticed Lewis was wearing a Tulsa Golden Hurricane t-shirt. Lewis was stunned. She knew all about legendary high school coach Gordon Wood, who led the Brownwood Lions to win seven state championships, but she had never heard of a female coach. She started peppering VanWaters with questions. Finally, she took a breath. At the time, Lewis was no longer with the Dallas Morning News and was working on other writing projects. Over a series of lunches in Southlake, VanWaters told Lewis about her mother’s aunt, Tylene Wilson. VanWaters said that she and her sister spent summers visiting Tylene and her husband, John, churning ice cream in the backyard and listening to the grown-ups reminisce. Tylene was modest, but her family was well aware of her accomplishments. She had gotten a master’s degree in 1953, when a lot of women were lucky to graduate from high school. She taught at Brownwood ISD for 40 years, and for 18 of those years she was a principal. She didn’t have children, VanWaters said, so education was her baby. And so was football. Tylene was in her late 30s when she stepped in to coach for one season, in 1942, after the high school football coach had enlisted. As VanWaters’ mother told her, “You just looked up and all the men were gone.” Tylene wanted to keep the football program alive because no one knew what would happen when they graduated. Tylene said she didn’t want them to resent their lack of a childhood when they were on the battlefield of Iwo Jima. Lewis initially wanted to write a biography of Tylene, but when she started digging into Brownwood’s history, she discovered that the school’s records had been destroyed in a fire in 1960. With no background in fiction writing, she considered abandoning the project. But then she enrolled in the Mountainview M.F.A. program at Southern New Hampshire University and spent the next two years working on her manuscript as her thesis. Before the book was even finished, Lewis had an agent, a publisher, and a movie deal. 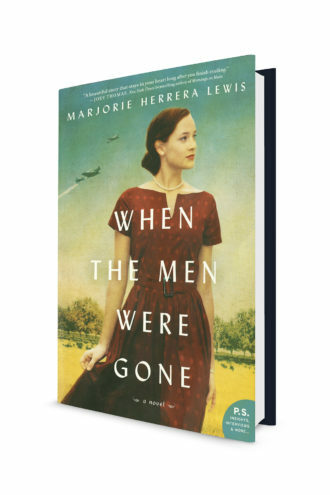 When the Men Were Gone isn’t marketed as young adult fiction, but perhaps it should be. With simple prose, Lewis creates a throwback heroine, dressed in white gloves and a pearl choker, who isn’t afraid to kick off her pumps to run down the field in her stockinged feet, despite the bullies and naysayers on the sidelines. Lewis sprinkles in historical details, such as the devastation wrought by the 1909 Zephyr tornado that killed dozens, the impact of segregated Army divisions in WWI, and the dreaded news delivered seemingly daily during WWII by soldiers on bicycles to the town on the outskirts of Camp Bowie. But mostly the book explores a few life-changing weeks in Tylene’s life, as she prepares the team for its first game. It’s a story about what it took for a woman to walk into the principal’s office and tell him that she wanted to coach football, when no one thought a woman should. The book resonates because, even with the likes of Charlotte Jones Anderson in the owner’s box and Pam Oliver reporting from the field, football is still a male-dominated industry. Which is why, after Lewis finished the book, she decided to coach. when she was assigned to the Dallas Cowboys beat in 1986, Lewis was less than thrilled. At her first meeting with general manager Tex Schramm, he asked her how it felt to be assigned to cover “the best team playing the best sport in the world.” “I prefer college football,” Lewis recalls saying, in the postscript to her novel. “I didn’t ask for this assignment and I’d rather not have it.” Schramm called her a fool. Lewis snapped back, “Does the idea of a 29-year-old woman, 5 feet, 2 inches, give you comfort? Because if my appearance leads you to believe I’m a pushover, you do know you’d be wrong.” After that, she found she had the respect of both players and coaches. Football itself was always the easy part for Lewis. Growing up before the enactment of Title IX, which was intended in part to provide equity in athletic opportunities for females, Lewis found there were no varsity teams for girls. So she played basketball and flag football on club teams and pitched on a boys’ softball team. She would sit in the car in the parking lot of the A&W and listen to college football games on the radio with her mother, who would explain the elements of the game. She never thought she would coach. But shortly after finishing the book, Lewis heard that Texas Wesleyan University, in Fort Worth, was reviving its football program, which it had disbanded in 1941, when most of the football team collectively decided to enlist after the attack on Pearl Harbor. On December 7, 2016, 75 years to the day that lives in infamy and changed Tylene’s life, Lewis was accepted as a volunteer defensive backs coach. At the time, a reporter told her, she was the only woman in the country coaching college football. “I knew I couldn’t just step in and start telling them techniques and all that kind of stuff,” she says. “My role was to observe. All those things that I had learned as a journalist—I knew what to look for. I knew what they’re supposed to do. So I was charting.” Quincy Butler, the defensive backs coach, would then use Lewis’ notes to determine his starting lineup. Lewis coached for only one season. When she found out her book was due to be published in October, she decided to stop because she could no longer give it her all. But she hopes more women—like Tylene, like her, and like Jennifer Welter, a professional women’s football player and the first woman to coach in the NFL, for the Arizona Cardinals—decide to get into coaching. But, she says, it will take more than women simply taking to the field.